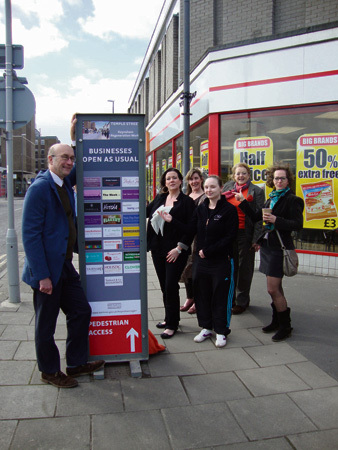 Keynsham traders have welcomed new signage pointing shoppers in the direction of their Temple Street stores. Bath and North East Somerset Council has installed a new podium outside Iceland and placed better signage on hoardings around the regeneration site. The move comes after talks between traders and council leaders about the impact the £34 million project is having on nearby shops during the construction phase. Councillor Paul Crossley, leader of the council, visited Keynsham to unveil the new podium with traders. He said: “Although there is a £34 million regeneration project taking place in the centre of Keynsham, the council wants the message to be clear. Keynsham is open for business and we want both local residents and people from outside the town to shop here. “We have already taken steps to support traders through the construction period, such as additional free 30-minute car parking spaces in Ashton Way car park and no on-site canteen for construction workers for the duration of the project."